This paper analyzes the proposal of the European Commission for a new regulation on the "Governance of the Energy Union". The analysis is framed around two questions: Is the proposed system adequate for supporting the implementation of the 2030 targets? Will it help Europe to get on a long-term pathway to a zero carbon economy? The paper focuses on the National Energy and Climate Plans (NECPs) as well as compliance and contains concrete proposals in legal language on how to improve the Commission's proposal. This paper builds on related papers by the Ecologic Institute and takes inspiration from intense discussions with colleagues in the ECF Governance cluster. On November 30th, 2016, the Commission published the proposal alongside a (winter) package of other related pieces of legislation. The proposal integrates and replaces the existing Monitoring Mechanism Regulation (MMR). As its central innovation, the proposed regulation requires Member States to adopt National Energy and Climate Plans (NECPs). NECPs will replace existing separate plans for renewables and efficiency and help streamline related obligations for planning and reporting. Monitoring progress will take place under a new annual cycle in the framework of the Energy Union, which is similar to the European Semester. The proposal puts forward requirements for the content of the plans, including a detailed and binding template for Member States to use. Importantly, it also contains the process for adopting and monitoring national energy objectives on renewable energy deployment and energy efficiency, as Member State contributions to EU level binding targets in these areas. 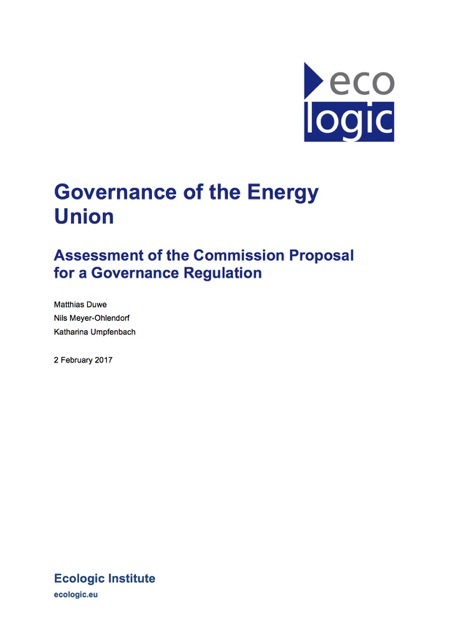 Duwe, Matthias; Meyer-Ohlendorf, Nils; Umpfenbach, Katharina (2017) Governance of the Energy Union - Assessment of the Commission Proposal for a Governance Regulation, Ecologic Institute, Berlin.